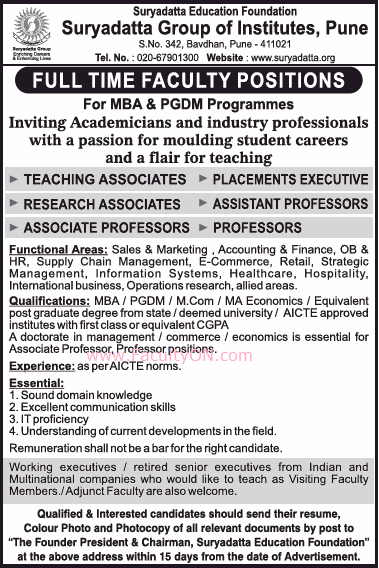 Suryadatta Group of Institutes, Pune has advertised in THE TIMES OF INDIA newspaper for recruitment of Professors / Associate Professors / Assistant Professors / Teaching Associates / Research Associates / Placements Executive jobs vacancies. Interested and eligible job aspirants are requested to apply within 15 days from 10th October 2018. Check out further more details below. About College: The Suryadatta Group has emerged as a reputed brand devoted to quality Management education by Industry leaders with proven track records. The Suryadatta Group is a virtual melting point of aspiring Managers comprising a diverse social, geographical and lingual mix from across the Country, bringing with them all the advantages typical of a hybrid group. Its novel Curriculum aims at providing a level-playing field for its students when they foray into the Corporate World. Salary Package: Not a bar for right candidates. How to Apply: Interested and Eligible candidates may send their resume along with recent colour passport size photograph and necessary documents to THE REGISTRAR Post within 15 days.